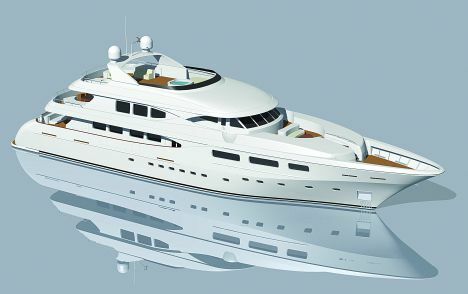 Fipa Italiana Yachts has started production of a new super-yacht, the Maiora 43, designed by the architect Roberto del Re. The hull is in steel with aluminium for the upperworks, this latter material permitting a good compromise between resistance and reduced weight. The bottom is semi- displacing, a solution that guarantees sailing comfort combined with good speed performance levels. The four decks on the Maiora 43 offer refined, well- planned interiors, created using the best materials available. The layouts are fruit of a careful study of ergonomics and practicality, with the sleeping area offering beds for 12, organised in cabins that put to full use the beam of the lower deck. Particular attention to detail has gone into the outside relaxation areas, the main deck includes a dinette in the cockpit with sofa and table and on the upper deck we find a dining area on the extension astern and a relaxation zone in the bows. The flying bridge has a roomy cushioned area for sunbathing, a circular Jacuzzi tub and another dinette with seating and small tables. For further information: Fipa Italiana Yachts; via Sarzanese; 55054 Massarosa (LU); tel. +39 584 93353; fax +39 584 93118 oppure via Tetrarca 14; 55049 Viareggio (LU); tel. +39 584 388330; fax +39 584 388974; website www.maiora.net; e mail info@maiora.net. Official cruising speed: 14 knots.